How much does it cost to travel to Chicago? How much money will you need in Chicago? $180 is the average daily price for traveling in Chicago. The average price of food for one day is $34. The average price of a hotel for a couple is $225. Additional pricing is in the table below. These average travel prices have been collected from other travelers to help you plan your own travel budget. How much money do I need for Chicago? Located in the Midwest, Chicago is the third largest city in the United States. It has a population of almost 3 million and a metropolitan area that covers more than 10,000 square kilometers. It is also a hub for music, comedy and theater. It's skyline is beautiful with modern skyscrapers and Lake Michigan as a backdrop. It is easy to stay entertained in Chicago for weeks. There are world class museums, upscale or eclectic shopping opportunities, and impressive architecture. Chicago is known for its cold winters and bitter wind. The city experiences four different seasons. Summers can be warm and humid with temperatures averaging around 75 degrees Fahrenheit and highs reaching above 90 degrees Fahrenheit for parts of the summer. Winters experience a lot of snow and highs can stay below freezing. Spring and fall are pleasant with low humidity. Chicago has something for everyone. There are world class museums, adrenaline filled sporting events and beautiful architecture. Some of the more popular museums include Adler Planetarium, the Field Museum of Natural History and Shedd Aquarium. Notable buildings and landmarks in the city include Sears Tower, the Old Water Tower, the Magnificent Mile, the Navy Pier, Buckingham Fountain, John Hancock Center, and Tribune Tower. Also make sure you head to the shore of Lake Michigan and spend some time at the beach. On a nice day it's bound to be crowded with Chicago locals. Parks are also popular throughout the city. If you're in town on a beautiful day then head to some of the area's interesting parks which include Grant Park, Millennium Park, and Midway Park. Most visitors to Chicago stay in the central area. 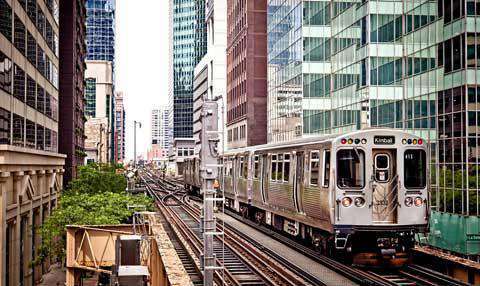 The most popular neighborhoods include the Downtown, River North, Streeterville, Old Town, the Gold Coast, Central Station, the South Loop, Printer's Row and Greek Town and many more. In these neighborhoods you'll find many of the city's top attractions, impressive skyscrapers, and entertainment options. Don't limit yourself to these neighborhoods though. If you have time, explore outside of this central area and you'll find plenty of hidden gems that are worth a visit. Neighborhoods throughout the city each have their own character and history. The diversity within the city is fascinating and the character changes from neighborhood to neighborhood. Each area has something to offer visitors. Chicago has no shortage of activities. From the theater to the sporting events, there's likely to be any number of options available when you're in town. Festivals also take place most weekends throughout the year. The city doesn't let its cold weather dampen the fun. One of the city's biggest festivals is Taste of Chicago in July. This is the largest outdoor food festival in the world. Popular music festivals include the Blues Fest and Gospel Fest in June, Lollapalooza in August and the Jazz Fest in September. Chicago is famous for its food. There are many famous restaurants around the city and there are a handful of local specialties that you must try while you're in town. Perhaps the most notable is the Chicago style pizza. It's a deep dish pizza that is made with a thin layer of dough that is layered with meats and vegtables, mozzarella cheese, and then a tomato sauce on top. It's hearty and delicious and a must try while you're in town. Also make sure you try a Chicago hot dog. They are all beef and served on a poppy seed bun. Toppings can get extravagant and include mustard, tomatoes, pickles, peppers and onions. There is also a wide diversity of ethnic cuisines around Chicago. If you're looking for something specific, find the right neighborhood and then wander around until you find a good restaurant. Your options include Greektown, the Devon Ave Indian corridor, Chinatown, and Chatham's soul food and barbecue. You can find almost any type of ethnic food somewhere in the city so do some research and figure out what appeals to you. Chicago is relatively easy to explore. The blocks are numbered consistently throughout the whole city. Each block is about an eighth of a mile long and the street is given a number based on how far it is from the intersection of State Street and Madison Street. Streets that run north to south are labeled with a W (west) or E (east) and those that run east to west are labeled with a N (north) or S (south). In general, the city is very walkable. If you're in town during the cold winter months, check out the Chicago Pedway System, which is a network of passageways that connect the downtown buildings. If you're traveling a significant distance, public transit is definitely the best way to go. There's a good train system that is fast and efficient. It is referred to as the "L" and the train lines radiate from out from a loop. It connects with most places within the city. There are also buses that cover the areas that aren't reached by train. It's best to avoid driving in Chicago because it is not worth the hassle. Parking is expensive, and although the roads are relatively easy to understand, traffic can be slow.